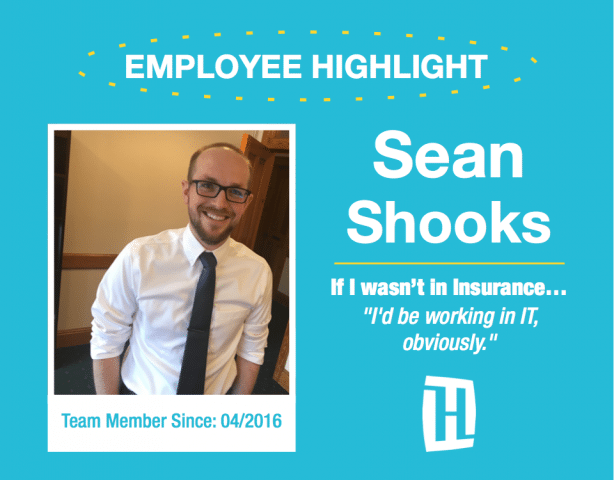 Hey there, my name is Sean Shooks and I am Heacock’s IT guy. I started down the IT path, like many others in the field, by fixing PCs for friends and family. Once people find out you “know computers”, it never ends. I was fortunate enough to grow up when the internet was just starting to take off, which afforded me the opportunity to teach myself my craft. I agree with the adage, find a job you enjoy doing, and you will never have to work a day in your life; this is what I love to do. 1. Current Position: IT Manager, I keep all the servers and systems running. Mostly, my role consists of problem solving and looking for ways to improve our efficiency. 6. Hobbies: Reading (mostly online), video games, and electronics. 7. Obsessions: Coffee, learning, security, and the Oxford comma. 9. If I wasn’t in Insurance… I’d be working in IT, obviously.